SEOUL, South Korea – Every night, hundreds of visitors at the famous Lotte World theme park in Seoul gather at the Garden Stage to watch an all-Filipino band perform and sing Korean and English songs. Since 2007, band Musimix has been enthralling Korean and foreign visitors at Lotte World, the largest indoor theme park in the world, which is visited by six million people every year. Bulletin Entertainment interviewed members of Musimix at Lotte World about their experiences in performing in South Korea. Musimix is composed of band leader Batch Ramos, main vocalists Daisy Zapanta, Cesar Anonuevo and Jhun Lapaniete, lead guitarist Allan Co, keyboardist Larry Luanzon and bass guitarist Val Villanueva. Ramos said Musimix was formed in 2007. “Musimix was formed in South Korea. Its members came from different Filipino bands,” he said. Since then, the nightly gig at Lotte World has become one of the theme park’s main highlights. Musimix’s repertoire includes hip-hop and rap, and 80 percent of the songs are Korean. Every night, they dish out 10 to 12 songs to complete the 40-minute show. During Bulletin Entertainment’s visit to Lotte World, hundreds of Koreans were in the audience. Not surprisingly, the band has its own fans. During the performance, the fans cheered, danced to the band’s music and asked for their autographs at the end of the show. Musimix members are seasoned musicians whose talents were honed through the years. Band leader Ramos first started working as a musician in Osaka, Japan from 1979 to 1983. He went back to the Philippines and worked there from 1984 to 1989. “Rock concerts were very popular then so I decided to stay in the Philippines,” he said. He worked in various clubs in Metro Manila. In 1993, he decided to go abroad and worked in Cambodia and Indonesia. His band then transferred to Phuket, Thailand and stayed there from 1995 to 1999. From Thailand, his band went to Seoul upon the recommendation of his cousin, who was a singer. His group later disbanded. His Korean boss decided to form a new group, Musimix, and recruited members of different bands. On the other hand, Zapanta is the only female and the newest vocalist of Musimix, having joined the group only last year. She said she was already a singer back in the Philippines and started her career at age 18. Her work in South Korea is her first job abroad. She was able to work in Korea through the help of her sister, who is also a singer. She met her sister’s Korean talent manager who recruited her to work in Korea. While working in South Korea, Zapanta also had a chance to be a guest on a TV show by Arirang channel in 2009. “I really love singing since I was young and singing runs in my family,” she said. For his part, vocalist Lapaniete started as a solo singer in Iloilo City from 1989 to 1991 until he decided to try his luck in Manila. From 1992 to 1994, he sang with the Southern Idea Band in Quezon City. He then joined Pegasus Band and worked in Hainan, China from 1994 to 1995. In the next two years, his band worked in the Philippines (where he sang at Cowboy Grill in Manila), and in Taipei, Taiwan. He then joined Haring Gangis Band and sang in Manila from 1997 to 1999. He went to South Korea in 1999 with Haring Gangis and Fragile Bands until he joined Musimix. Anonuevo said he started as a minus-one singer in Legazpi City in Albay. He was later recruited by a band, which passed the audition held by a Korean owner of an entertainment agency in Seoul. In South Korea, Anonuevo also joined contests and won. He won as champion in a singing contest by KBS in 2002 and was second runner-up in a singing contest held by channel ETN TV. He was also the winner of the Ginoong Pilipinas Korea in 2003. He is one of the lead singers of Musimix. Luanzon started as a musician in 1994 at the age of 22. In 2000, he went to Malaysia to work with Night Brew Band until 2002. From 2002 to 2005, he played at Alicia Hotel in Legazpi City in Albay with Night Brew band and at Cockhouse in Laoag with Shockwave band. In 2005, he went to Dubai to play with Sound Machine Band at Rocky’s Café at the Regent Hotel for six months and then in Abu Dhabi. He went back to the country in 2006 and played for Psychoscream Band. The following year, he joined Psychoscream to work in the United Arab Emirates and then Dubai until 2008. His last band was the Xound Xirkit before he went to South Korea to join Musimix last August. Lead guitarist Co worked with Luanzon in Psychoscream and Xound Xirkit bands as bassist. He said he played in every barangay in the Calabarzon, Mindro and Manila. He was also able to work in different Asian countries before joining Musimix last year where he is now its lead guitarist. Val Villanueva started his band career in 1979. In 1981, he worked in Okinawa, Japan and in 1989, he played at Mandarin Hotel in Singapore. Since 1990, he has been playing at Lotte World. In 2009, Musimix became a guest on “Star King,” the famous talent search TV show in South Korea, which helped propel the career of Charice Pempengco. One of the most memorable experiences the band had was becoming a guest singer on “Star King,” the show which helped propel the career of Charice Pempengco. During the show, Musimix sang several Korean songs that impressed the star cast/judges including members of Super Junior and 2PM. Despite that they are away from their families, Musimix members are enjoying their work at Lotte. They said they only work for 40 minutes every night and get to entertain the theme park’s guests. They said what they love the most about their contract is the length of their stay in South Korea. Under their contract, they work for two years straight before going back to the Philippines to have their vacation as provided in South Korean law. And to prevent disruption of the band’s performance, what Lotte World did was to provide each member a different vacation period so that only one member will be absent at a time. “What Lotte did was instead of sending us all home all at once, they changed our vacation periods,” the band said. After two years, each member goes home and spends about two months in the Philippines and then goes back to South Korea. They praise the Lotte World management for treating them very well. “We won’t last this long if we are not treated very well,” Cesar said. While they have the option to bring their families to South Korea, members said it is more practical and economical not to. Instead, they save their earnings and send money to the Philippines and communicate with their families via the Internet. During their spare time, members also accept gigs. 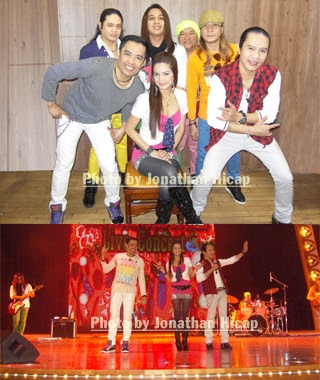 The Philippine Embassy in Seoul regularly invites Musimix to perform in events and they also do front acts for Filipino singers who hold concerts in South Korea. Musimix has come a long way since starting five years ago. They said that they are proud that with their talents, they have become sort of ambassadors not only for Lotte World but for the Philippines as well. “We are very happy that through Musimix, we spread the Filipino talent in singing,” they said.